The day of your cruise can be hectic and unorganized. You have to make sure you packed everything you need, drop the kids off with the sitter, and make it to the port on time. However, if you”re leaving on an evening departure, you might find yourself with more time than you thought. Here are a few things you can do before embarking on your cruise. Taking a trip means buying souvenirs, lots and lots of souvenirs. You have to get something for the kids, your friends, your coworkers, your siblings, and so the list seems endless. On the cruise ship, there are tons of shops to choose from and it”s easy to walk by and just pick up a little something as a present. However, a few dollars here and there every day for the length of your cruise will start to add up and before you know it, you have a hefty bill to deal with. Do yourself a favor and avoid that before your trip even starts. There are many great upscale shopping locales to visit on Las Olas boulevard, the “Rodeo Drive” of Ft. Lauderdale. You can also check out some great bargains at the Sawgrass Mills Mall on Sunrise Boulevard. This is also a great time to survey your luggage and make sure you”re not missing something essential like toiletries, a bathing suit, or something nice for a formal dinner. Some people think their vacation doesn”t begin until the cruise ship sails off into the sunset. This doesn”t have to be true if you”re good at making plans. Ft. Lauderdale is full of wonderful things to see and do, you just have to make time for it. There are miles of beach, perfect for a nice relaxing stroll before boarding and dozens of different and wonderful restaurants for a pre-departure meal. If you”re looking for something out of the ordinary, Ft. Lauderdale has that covered too. There”s Butterfly World in Tradewinds park which is the largest butterfly facility in the world and houses 150 species of butterfly. Alternatively, you can head over to the Museum of Discovery and Science for a quick IMAX movie. Ft. Lauderdale also has a wonderful art museum full of modern and contemporary art and the Bonnet House, a historic estate for those looking to learn a little something new before heading out to sea. A good way to avoid all the chaos and panic of getting to the ship on time and making sure you have everything packed, is to get to the port a day in advance. There are plenty of great hotels and Inns nearby with reasonable one-night rates. Imagine waking up in the morning and not having to worry about making the bed, unplugging the electronics, or locking all the windows and doors. You just grab your bags, have a leisurely breakfast and walk on over to the ship. Some hotels even allow you casino online to keep your car parked in their lot while you”re away so you won”t have to deal with the parking garage. 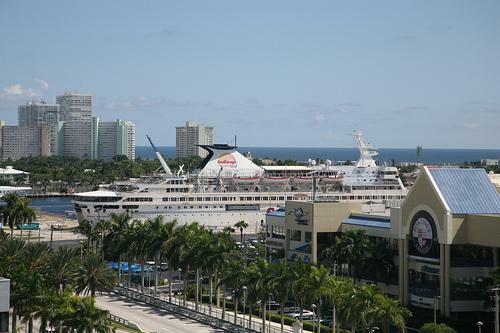 Arriving early also allows you to spend more time enjoying Ft. Lauderdale itself. The day before you leave you can go snorkeling at the beach, scuba dive around the three-tiered coral reef system or check out a real ship wreck, or rent a jet ski for a little more action. Do yourself a favor and take a vacation before you leave for vacation. If you”re not from Florida, or you don”t live close to the Everglades, do yourself a favor and take a day trip. You can explore the rare subtropical ecosystem by gliding through it on a fan powered airboat. There are plenty of trails and quick trips to take to see some of the most beautiful and dangerous Florida wildlife. If you”re traveling with the family, this is a great educational trip. They can learn all about the plants, animals, and the rich history of the Seminole Indian tribe. It”s also a great way for the kids to burn off some energy and excitement before getting on board the ship. trolley that you hop on, buy your ticket, and then jump off at the stops that look the most interesting. When you”re done exploring, just get back on at one of the stops. You just pay once, and you can ride all day. This is the perfect way to see all the sights, check out all the beaches, and discover some wonderful shops and restaurants. It”s faster and more efficient than walking, and if you have the whole family with you, this is definitely the way to go. If you really want to arrive in style and feel like a celebrity, you can hire a private car to pick you up from the airport and take you on a tour of the city. The driver will take you to all the most famous and beautiful locations and help you discover why Ft. Lauderdale is called “The Venice of America”. You”ll get to see Las Olas Boulevard, the Riverwalk, the Stranahan House, and of course all the fabulous beaches. If you decide to get out for a photo opportunity, your luggage will be safe inside your hired car. Once your tour is complete, the driver will take you right to your ship. Why fight traffic and scour the city for parking when you can be dropped off right outside? Skip the stress and do yourself a favor. Next time you embark on a cruise out of Ft. Lauderdale, take a little extra time to explore this vibrant and exciting city. When you”re in Florida, every day is a vacation. Enjoy everything Ft. Lauderdale has to offer before you set sail.